New York City pedicab scam: How not to get scammed by a pedicab driver. 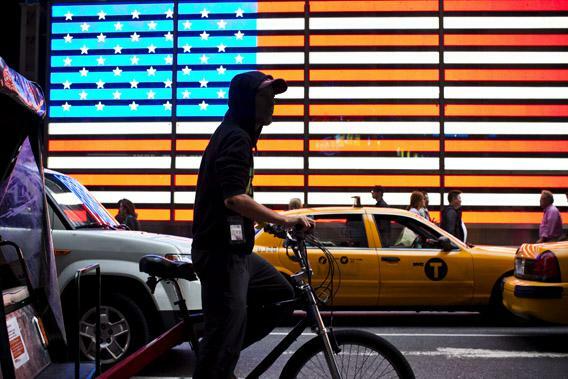 In this file photo, a peddle-bike rider waits at a stop light in Times Square in New York on Sept. 29, 2012. If you’ve visited New York City at any point over the last decade, you’ve probably seen the city’s many pedicabs—the bicycle-powered rickshaw-type vehicles that carry tourists around Times Square, through Central Park, and other places that appear in guidebooks. When you come to New York, you don’t have to take a pedicab. But if you’re scared of the subway, allergic to horses, and stuck wearing flip-flops, how else are you going to get around? It might behoove you to find another means of transit, because—in New York, at least—pedicab drivers are a menace. They’re slow, inconvenient, and they might be trying to rip you off. Many, many New York tourists have been stung by unscrupulous pedicab drivers—so much so that the city of New York recently passed a law requiring pedicabs to charge a per-minute rate only, and have that rate clearly posted in 28-point font. But drivers will still be able to set their own rates—and, anyway, tourists who have been scammed before can be excused for wondering whether all of the drivers will comply with the new law. These scamsters rely on tourists being too confused or too polite to resist their ploys. Here’s how you can fight back if you find yourself in the middle of a rickshaw con. Loudly and clearly state the law. This might be the best way to avoid being bitten by this scam. Before you get into the pedicab—before you come to New York, even—print out this sheet from the Department of Consumer Affairs that clearly states what pedicab drivers are allowed to charge. Before the pedicab driver can sweet-talk you, say something like “According to city statutes, pedicabs are only allowed to charge a per-minute rate with no additional fees.” If they try to convince you that you’re wrong, get out of the cab, because you’re being scammed. Don’t be afraid to haggle over the price, either. It’s New York! If you’re clear about what you want beforehand, you’ll avoid a lot of trouble later on. Look for an older driver. A veteran New York pedicabbie who posted on a TripAdvisor forum about Manhattan pedicab scams offers some advice that quickly swerves into xenophobia. “If you want a pedicab and are worried about being overcharged, look for the one with the oldest driver,” writes “tourguidestan.” “The older American drivers, BTW, still charge less than the new guys who come in from all over the world.” So, basically, you want to find someone who is visibly displeased with his job, and who is so old that he might collapse if he attempts to ferry a family of four. Take note of the driver’s ID. The great J.J. Bittenbinder, from whom I take all my personal safety tips, recommends you make the driver aware that you know and will remember his name or his ID number. You don’t have to be adversarial about it. Bittenbinder suggests that, for example, you recite the ID number out loud, and then say something like “Oh, weird, that used to be my address”; or say his name, and then say “I’ve got a friend with that exact same name.” The idea is to let the driver know you are likely to remember his identifying information, and thus hopefully dissuade him from trying to scam you. This presumes, of course, that the driver is actually displaying his ID, which isn’t always the case. If there’s no ID on display, I guess you could trick some information out of him by saying something like “Come on, driver, let’s play a game, I bet I can make a rhyme out of anybody’s name. Including yours!” There’s never a bad time to play the Name Game. Make a scene. If you feel like you’re being scammed, there’s no reason to sit back and let it happen to you. Get angry. Get loud. Call for a police officer. There’s no guarantee that an officer will appear, but if you’re loud and aggrieved, there’s a chance that the driver won’t want to deal with the hassle, and will just back off and give you what you want. I guess there’s also a chance that he’ll yell back. But just consider it part of the New York experience. New York! Where people yell! Don’t take a pedicab. This is the best advice I can offer here. New York pedicabs are horrible. Sure, they might look like fun, but then you get in one and you realize that it’s super-slow, and the air quality is terrible, and it’s probably dirty. Find some other way to explore the city. Take a walk, for example. If you absolutely must blow a bunch of money on some inefficient transportation, take a horse-drawn carriage, or a Segway.